HOME 1 Los Avellanos Rural Houses. 3 houses, 4 people in each. Los Avellanos are three houses that are located on a private estate and that are rented intact, not by rooms, independently or jointly. They offer you the possibility to enjoy Celis, a beautiful and quiet town of about a hundred inhabitants. Celis belongs to the Nansa Valley, one of the valleys that best preserves the charm of its towns and its landscapes, a wonderful place to enjoy nature. Next to the caves of El Soplao and the caves of Chufín. 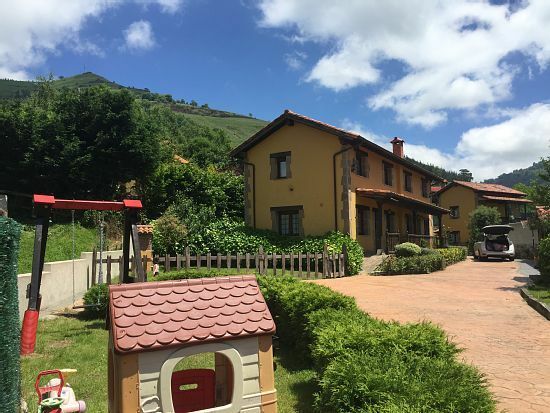 Ten minutes from the beaches of San Vicente de la Barquera or Pechón and very close to the Picos de Europa. In less than an hour by car you can visit the nature park Cabárceno, Santander, Santillana del Mar, Comillas, Bárcena Mayor and endless ideal places to enjoy Cantabria. Our location also allows you to get closer to Asturias in 15 minutes. - The houses are fully equipped for four people. - Each house has two floors of 40 m2 each, with two bedrooms and a bathroom on the first floor, and the living room with fireplace, television and kitchen on the ground floor. - Outside you can enjoy a large private estate, with the comforts of a porch, a large garden, children's area and a spacious private parking. La casa está genial, muy limpia y no le falta de nada.Hemos disfrutado mucho del jardín, sobre todo nuestras hijas Eva y Silvia, y también de la barbacoa. Gracias a Lorena por su trato. HOLA, NOSOTROS ESTUVIMOS UN GRUPO DE AMIGOS EN LA CASA 3, Y TENGO QUE DECIR QUE LA CASA ESTA GENIAL¡¡TIENE DE TODO...VASOS, PLATOS, CUBIERTOS, TOALLAS, SABANAS, LAVAVAJILLAS, HORNO, TOSTADOR...EN FIN TODO LO NECESARIO PARA QUE NO HECHES DE MENOS NADA¡¡EL JARDIN ES MUY BONITO, EN VERANO SE TIENE QUE ESTAR GENIAL¡¡¡EL PUEBLO ES PEQUEÑITO PERO TIENE UNA TIENDA CON TODO LO QUE NECESITES, Y SI NO A 4 KM HAY UN PUEBLO MAS GRANDE CON FARMACIA, VARIOS BANCOS Y TIENDAS, Y BARES. LA DUEÑA DE LA CASA LORENA ES UN ENCANTO¡¡NOSOTROS LE PEDIMOS MAS LEÑA Y SIN NINGUN TIPO DE PROBLEMA NOS DIO MAS¡¡Y SIEMPRE ESTA DISPUESTA A INDICARTE ALGUNA RUTA, ZONA O PUEBLO PARA IR A VISITAR¡¡MUCHAS GRACIAS POR TODO LORENA¡¡OJALA PODAMOS VOLVER PRONTO¡¡ESTEFANIA. Como comento en el título viajé con mis bebés que en ese momento tenían 4 meses. Buscábamos un entorno tranquilo y lo conseguimos. En las casas rurales de Lorena estuve como en mi propia casa. No le falta ninguna comodidad. Estuve 15 días en julio y lo único que por mis circunstancias (dos bebés muy pequeños) tendría que haber elegido la casa que está independiente, por la intimidad y por la secadora!! Pero vamos, recomendable 100%. Hemos pasado una semana en la casa nº3 y nos ha gustado mucho. Dispone de todas las comodidades y Lorena fue muy atenta. La zona es muy agradable y se encuentra bien comunicada. La casa estaba en perfecto estado y no faltaba detalle.